ON THE BOWL: Marshall bowler Brad Greenwood in action last weekend. Geelong Cricket Club has leapfrogged Essendon on the ladder after an impressive victory last weekend at Kardinia Park. Batting first, the Cats piled on the runs, with Mitch Reid (161) making his maiden century at the top of the order in a marathon four-and-a-half-hour stay at the crease. He was joined by Hayden Butterworth (129) in an incredible 262-run partnership for the second wicket. Dom McGlinchey (29) did some late hitting to boost the total to 396. In reply on Sunday, Essendon started well with a 92 run opening stand on the flat batting wicket. At 2/181, the visitors would have felt they were a good chance of winning. However, the total proved too much, as McGlinchey (4/55) continued his good run of form, while Joel Blain (3/85) leant good support as Essendon was dismissed for 286. The win sees Geelong retain fourth place on the ladder, with an away game against Carlton over the next two Saturdays the perfect opportunity to consolidate the Cats’ place in the top four. 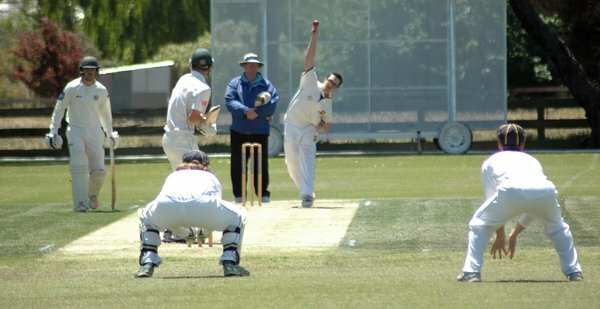 In Geelong Cricket Association, East Belmont appears to hold the upper hand in the match of the round at South Barwon. The Lions won the toss and elected to bowl, a decision they may have regretted early as Joel Davies (76) smashed them to all parts early. But when Chris Williams (5/31) had him caught on the fence, the rest of the line-up crumbled under the pressure to be all-out for a disappointing 150. With 14 overs still to face, the East Belmont top order was in no mood to simply hang around, as Andrew Baars made a brisk (23) while skipper Sean O’Neill (40 not out) took to the bowling to see his side move to 2/70 at stumps. South Barwon simply has to take early wickets on Saturday to be any chance of winning. In division two, Murgheboluc fought back well in its big game against Marshall after struggling early to be 4/72 as James Menzies (3/28) did all the damage. But Jason Grozdanovski (72) found a willing ally in Asher Hart (78), with the pair putting on 119 for the fifth wicket. Matt Middleton (42) put the icing on the cake as the Frogs finished the day on 7/279. Marshall has been very reliant on new skipper Corey Walter so far this season and really needs some of its other batsmen to stand up and make a big score if they are to chase down this imposing total. St Albans Breakwater will look to make it back-to-back outright wins when they resume against Waurn Ponds on Saturday. The Super Saints bowled first last week, dismissing its visitors for just 128. Adam Hausler (4/17) was the pick of the bowlers. In reply, Harley Cobb (51) wasted no time in knocking off the runs as his side finished the day on 8/155 with first innings points in the bag. The Super Saints will look to replicate that tomorrow and extend its lead at the top of the ladder, particularly as second-placed Bannockburn is in a bit of trouble against Guild Saints and will need to be at its best to win.